The US District Court for the Northern District of Ohio has ruled (pdf) that a parent’s refusing vaccinations for her children against diseases is not a “free exercise” of religion, and is tantamount to neglect. For New Year’s Day, I’m republishing the top 10 articles I wrote in 2013. Well, actually top 9, plus 1 from 2012 that just keeps going. #9. This article was published on 13 May 2013, and has had over 5000 views. A Federal court decided that refusing to vaccinate one’s children is not a constitutionally protected right covered by the First Amendment. 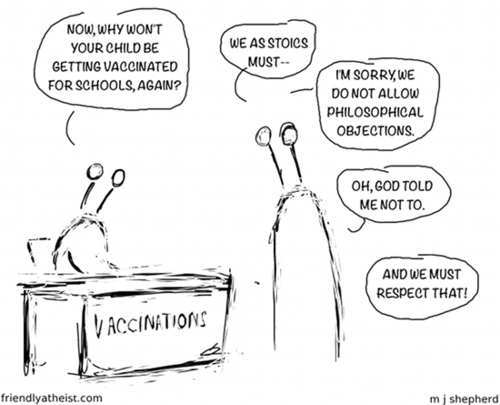 The US District Court for the Northern District of Ohio has ruled (pdf) that a parent’s refusal to vaccinate her children against diseases is not a “free exercise” of religion, and is tantamount to neglect.